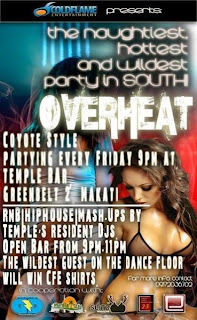 It's July 31, Friday...and right at this very moment, the last party night in Temple Bar is happening there in Greenbelt 2. Temple Bar will temporarily close for renovation...maybe to bring bigger and better parties soon. But for now, Cold Flame Entertainment is giving a thanksgiving party for those who never stopped supporting Temple Bar. Indeed, it's where all the good parties started. I remember a few years back when I used go there every time my friend organizes an event, such that of the Motorola Razr2 Party, and other random parties with open bar. In fact, I remember Temple Bar as one of the favorite spots of celebrities and other elites. But eventually, due to a lot of new clubs and bars opening here in Manila, it's already hard to bring back the crowd that Temple Bar used to have. Actually, the last time I dropped by Temple Bar, I've found the crowd really different--younger (aka sooo high school), less popular (uhm do i know them? ), and hmmm never mind. hahaha! Wait, I'm not being mean here ok? It's just that most of the people I used to see in Temple before are hanging out at bigger and newer clubs now. But yeah, it used to be where crazy RnB parties are at. Should I say, the new clubs owe it to Temple? hahaha! Well, I think...Temple had its time....just like any other place, thing, or person. You see, not all celebrities are at the limelight all the time...I mean, even their popularity fades too.